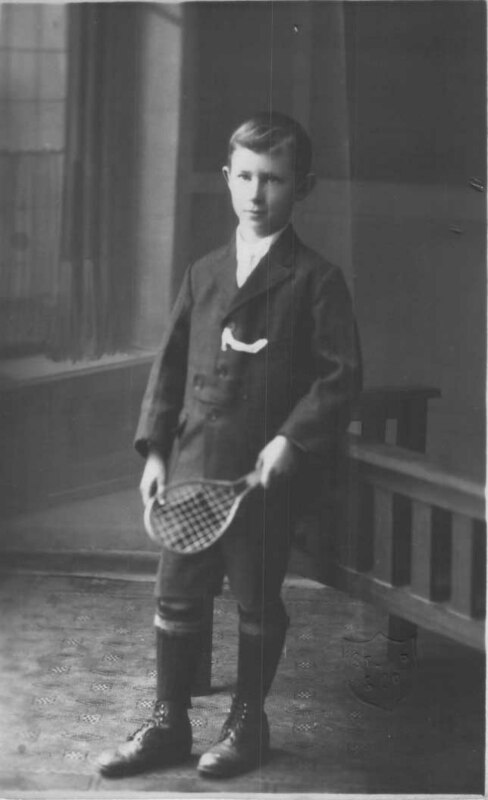 Melvin Alfred Becker was born on 24th August, 1916 at Laura, the fourth child of Richard and Emma Becker. Melvin was baptized in Holy Trinity Lutheran Church, Appila, on the 17th September. His funeral would take place in Laura exactly 97 years later on 17th September in 2013. As a child Melvin grew up with 6 siblings, Rita, Eric, Frieda, Linda, Lorna and Rex. 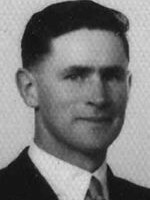 Melvin began his schooling at the Pine Creek State School on 22nd January 1923 when he was 6 years old. He left after four years, at the end of 1925 on 17th December. Melvin began at the Laura State School with his older sister Frieda on 26th January 1926. He finished his schooling at Laura on 20th November 1929 when he was 13 years old. Travelling to school by horse and cart meant not only learning the three R’s, but also tending to the horses. Melvin’s confirmation classes were at the Lutheran manse, Pine Creek. As far as he could remember, he rode his bike or the horse, a distance of about 9 kilometres one way, three times a week to attend classes. He was confirmed on 16th November, 1930 with 7 other boys. Melvin’s first working job on the home farm was stooking hay, and then feeding the sheaves of wheat into the chaff cutter to make feed for the farm animals. He also spent many hours walking behind the horse teams working the soil. This made for long and arduous days. Melvin was most pleased when his father built a seat on the implement, making land work much more comfortable. While still at home his neighbor Ern Wurst offered Melvin share farming work, which he accepted to help increase his income. At one stage he bought a tractor which made farming much easier. When asked by his daughter, Christine in his old age “How much horse power did it have?” he quickly replied “Not enough!”. As life progressed he was brother-in-law to Eddie Zwar, Anna Becker, Rheiny Wurst, Wally Bartsch and Grace Becker, and became an Uncle to many nieces and nephews. During this time, Melvin was a member of the Pine Creek Band playing, we believe, a tuba or double bass. Unfortunately the instrument, along with all of his 21st Birthday presents, disappeared down the Pine Creek in the great flood in January 1941. 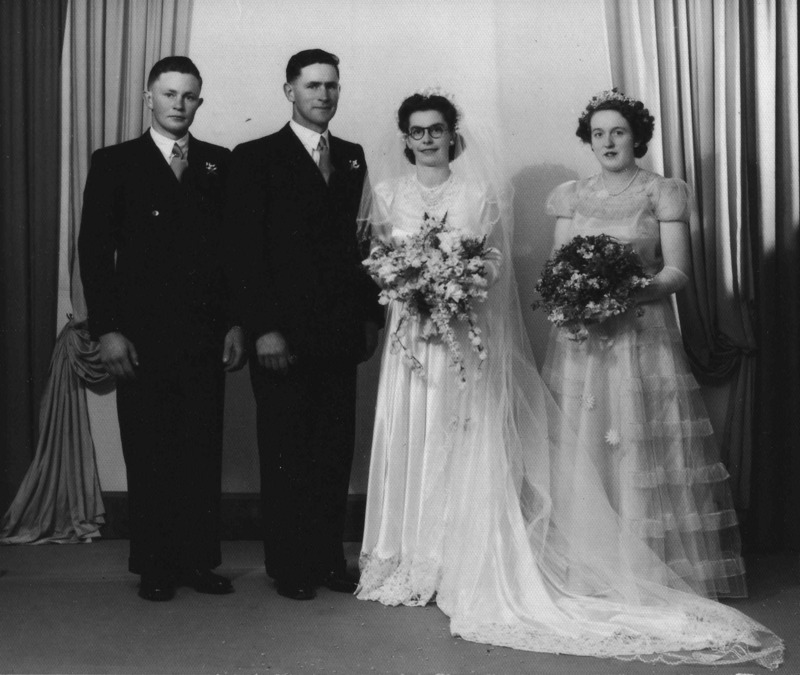 Melvin and Alice Becker wedding. Rex and Grace Becker attendants. On his birthday, 24th August 1950, Melvin married Alice Louisa Ottens. Melvin and Alice met several years earlier when Alice stayed at the Becker home for a youth convention. As the courting became serious Melvin, his brother Rex and a friend Arnold Wurst, would travel together to Brinkworth to see their respective girlfriends. Alice was delighted that Melvin was first to be dropped off and last to be picked up. Married life began living in a house built by the early settlers, on the farm that Melvin had been share farming. Seven years later when the neighbor decided to sell, Melvin and Alice bought the portion of the property they had been working. In 1964, Melvin and Alice moved into a new home they had built adjacent to the original house. The marriage was blessed with three children, Janice, Graham and Christine. Later the arrival of three grandchildren and then five great grand-daughters brought much joy to Melvin and Alice’s lives. Farm life evolved over the years. The early years were cropping and sheep farming, supplemented by milking cows, initially by hand, and raising chickens to sell eggs and hens. When milk and egg regulations were introduced the farm became cropping and sheep only. Melvin and his younger brother Rex worked closely together to enable the farm work on both their farms to be carried out successfully. Melvin was a hard worker and a skilled engineer and welder. This was evidenced by the improvements he made to the farm. These included building sheds, a shearing shed, sheep yards, the dip and other projects. An example of this skill was when Graham had returned from Whyalla to help on the farm. A “shortcut” from one paddock to another at about 9 pm one night with the Power Take Off Header, led to the P.T.O shaft being bent like a banana and some rarely heard colourful language from Melvin. After initially thinking the worst, several hours later their combined efforts had the P.T.O header back together and ready to go. Melvin was a kind and gentle man. He had a great sense of fairness and commitment to whatever he undertook. His faith in God was evident in his life through his love for his wife Alice and his children. Their wellbeing was always foremost in his thoughts and actions. His faith also led him to be involved in organizing the supply of grain to the Hermannsberg Mission in Central Australia in his earlier years, and later as treasurer of the Pine Creek Lutheran Church for 17 years. Melvin’s love for his family has led to the following fond memories from his children. Janice fondly remembers the Christmas tradition of Dad and Mum taking them to the Becker scrub, several days prior to Christmas Eve, to select a native pine for their Christmas Tree. The tree would be placed in the lounge, the doors shut and not opened until Christmas Eve. In later years they found out that Dad had greatly enjoyed helping mother with the decorating. Janice remembered how Dad had previously enjoyed fishing. When Glenn and Janice moved to Elliston they took him to Lock’s Well for Salmon fishing. He must have enjoyed it, as there was quite a climb down the cliff to the beach where there are now several hundred steps. Mostly they would come back with no fish so the steep climb back up hill wasn’t over burdening! When the grandchildren were young and they visited the farm, their grand-Dad would sit in the lounge chair after tea. It was never long before the children were leaning against the chair or sitting on his lap, quietly enjoying being in his company. Graham remembers the mischief that was caused by himself, inadvertently through Melvin’s actions. When very young (about two years old), he had climbed up on the roof of their home to explore after Dad had forgotten to take the ladder away from the house while repairing the roof. This caused Dad and Mum some panic while trying to figure out how to get him down. When Graham was five years old, Dad was burning off in the paddock and had left him in the truck. Having watched his Dad change gears many times young Graham initiated his own first driving lesson. Dad was left very bemused to see the truck trundling towards him with no apparent driver! Farming was not always dull with Dad. Having decided to remove a small dead tree with explosives, their first attempt failed to detonate with Dad commenting “what a fizzer!”. After a suitable time the second attempt (now unintentionally a double charge), resulted in dirt and rock landing on the workshop roof, Dad running for cover and the tree stump sailing past the house into the adjacent paddock. The so-called small dead tree had to be removed from the paddock with the frontend-loader. Christine remembers his strength, gentleness and patience when as a child she would sit on his lap in the big lounge chair after tea or when being hoisted over the gates while out in the paddock. For a time as a child she took great delight in shaving him on a Saturday night and for nephew Paul, and nieces Karen and Alison’s benefit, “Yes, it was an electric shaver”. Dad’s ability to divine for water was a marvel to watch. “The lasting memory I have is of the inspiring love and respect shared between Dad and Mum and his love and pride in his family.” Christine. During the 1980’s Melvin and Alice built their second home in Laura, moving there to allow Graham to live on the farm. During this time Melvin continued to go out to the farm to help Graham, made improvements to their house block in Laura, and enjoyed playing bowls on Saturdays. 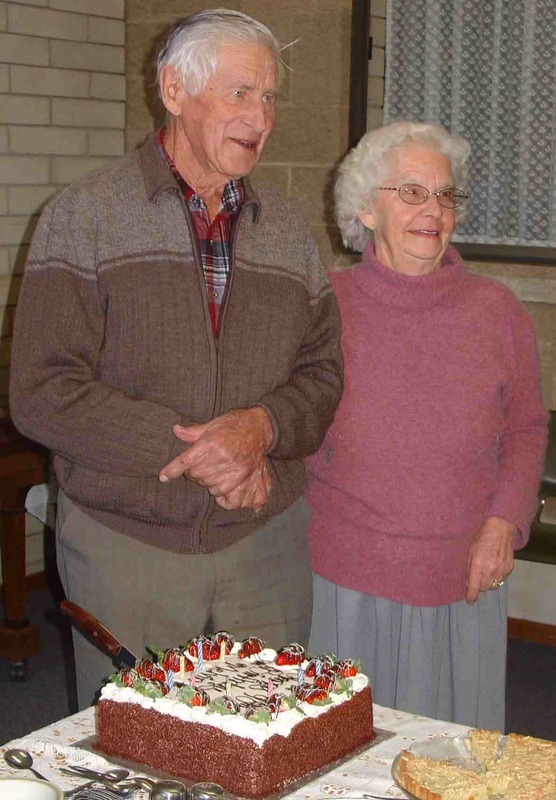 In 2006 Melvin and Alice moved to the Lutheran Retirement Village in Glynde in Adelaide. They enjoyed the friendship of good neighbours in their Court. Melvin’s interest in the land always remained. He would make several trips back to the farm every year. In 2012 Melvin’s health started todeteriorate. He was cared for in the North Eastern Community Nursing Home, and for the last two months in 2013 at the LHI Glynde where he was cared for with great kindness by the staff of Flynn Ward. With Janice beside him, Melvin passed away peacefully in the early hours of Wednesday morning the 11th of September 2013, at the grand old age of 97 years, and seven years to the day of moving from Laura to Glynde. The Laura Lutheran Church was full for the funeral and farewell service led by Pastor John Gerhardy on 17th September 2013, 97 years to the day after Melvin’s baptism in the Pine Creek Lutheran Church near Appila. His godson Kevin Zwar read Melvin’s confirmation text, 1 Timothy 6:12-16, and the eulogy prepared by Melvin’s family. This biography of Melvin Becker is completely based on the eulogy.